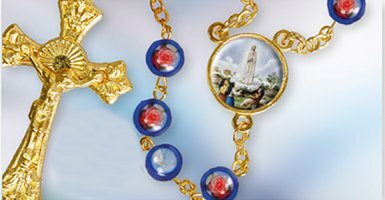 Our Lady of Fatima gifts page brings to you a selection of gifts souvenirs and memorabilia all depicting the apparitions. Between May 13, 1917 and October 13, 1917, In a small village of Fatima in Portugal Our Lady appeared six times to Lucia, 9, and her cousins Francisco, 8, and his sister Jacinta, 6. 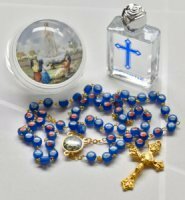 Glass Our Lady of Fatima Blue Rosary Beads. Glass Our Lady of Fatima Rosary Beads. 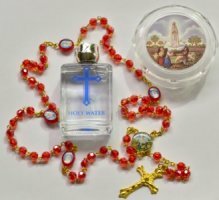 Fatima Crystal Rosary with Fatima Junction Medal & Rosary Box. Red Crystal Our Lady of Fatima Rosary Beads. 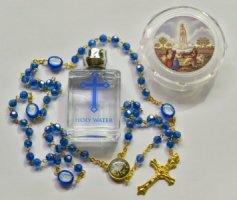 Glass Our Lady of Fatima Blue Rosary Beads & Holy Water. Our Lady of Fatima Pillar Candle. Our Lady of Fatima with Gold Foil Medal. Our Lady of Fatima Novena Booklet.